Long winded Preface: In the audio commentary of the Vanilla Sky DVD, Cameron Crowe makes a statement regarding his choice of using The Beach Boys “Good Vibrations” in the film’s score. In a nutshell, he wanted to reclaim the song for himself and his audience – take it away from the populist soda pop connotations that had so weighed it down over the decades. His comments resonated, as I too feel certain songs have sorely become part of our (commercial) musical vernacular, thus losing their original power. An immediate example, that comes to mind, is “I Heard It Through The Grapevine” — composed by Strong and Whitfield, popularized and given a soul by the late and great Marvin Gaye. For years I subconsciously connected the tune to animated, dancing raisins – as I am sure many of you reading did, as well. This brings us to the Violent Femmes. The aforementioned effect can also apply to an artist and their work. In this case it is the Femmes debut album which, while immensely popular, pigeonholed the band for the rest of their career. It’s fairly safe to say that anyone (re: “anyone” as referring to people who read music blogs) who came of age in the pop culture of America during the past 20 years is somewhat familiar with the Violent Femmes. If not intimately, then through a film’s soundtrack, the radio, MTV, your older sibling, babysitter, etc, etc. It was a musical rite of passage. So I suppose this post is a reclamation in a way. More specifically, their critically/commercially misunderstood second album Hallowed Ground. Upon its release, ‘ol John and Jane Doe were not expecting murder ballads, country death songs, disturbing religious imagery, backwoods gospel, and the generally bizarre overtone that encapsulated the core of Hallowed Ground. No “Blister In The Sun” here; in it’s stead are spooky tales sang in Gordon Gano’s misfit voice over a bed of acoustic weirdness. Unintentionally this album laid the groundwork for many of the freak-folk, gothic-country, and backwoods weirdness that have sprung up the past ten years. Great overview of the album here. Listen to this 1984 album with fresh ears, void of any pre-conceived notions about who and what the band were. “Country Death Song” is widely available, so I’ll leave you with the two tracks below. There are tales within these songs to be heard – perfect songs for Autumn, which has just arrived. 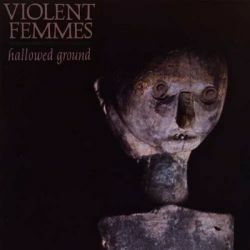 + Download Violent Femmes through eMusic’s 25 Free MP3 offer. + Visit The Hype Machine for additional Violent Femmes MP3s. This has always been my favourite VF album, and it is a shame its not better known. Yeah great album. Those vf fans who knew them by Blister in the Sun and were disappointed by this album were frat boys/ sorority chicks who just went back to listening to Frankie Goes to Hollywood or the Go-Gos. I have to say that if you had the pleasure to see them in concert prior to the second album come out, it wasn’t just about the catchy hooks in the first album that made them great. It was their live performances, got to be one of the best concerts I have ever seen (small bar, 200 people). And rare in America, the audience sang along, loudly, and often Gordon would back off the mic and let the audience sing the lyrics. What a sweaty, exhausting wonderful concert that was. When Hallowed ground came out, I’d be lying if I said that it took more than one spin to get into, but it quickly became one of my favorite albums, so much different from the first. I read somewhere that Brian is suing Gordon over lack of songwriting recognition and I suppose later royalties. Too bad. First congrats on being named LA’s best blog and of course I agree about Hallowed Ground but I would also make a case for 3. While Hallowed Ground was at least criticized and taken seriously by the press (while generally being ignored by their “fans”). 3 seemed to be ignored by everyone and it’s an amazing record with John Zorn like music to go along with Gordon’s increasingly tortured lyrics. “Just Like My Father” “Dating Days” Mother Of A Girl and the incredibly somber “See My Ships” are great songs, even the songs that veer dangerously towards novelty have deeper messages like “Fat” and “Nightmares”.